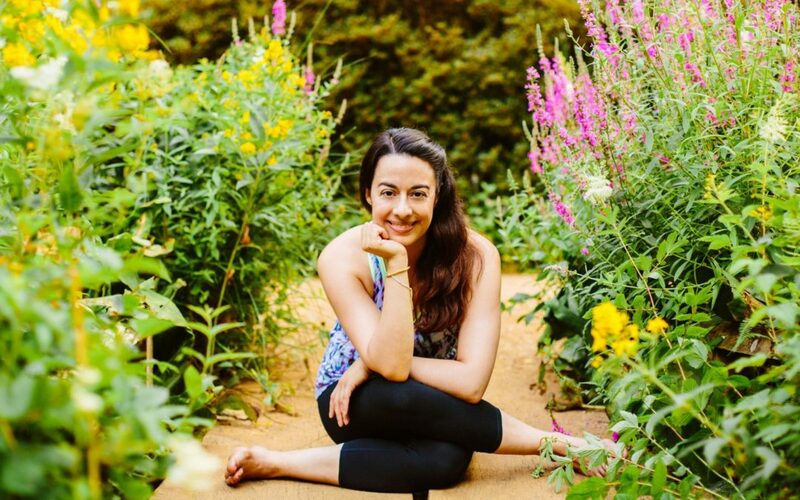 We are delighted to welcome Tawny Cortes to the Yoga West team. Tawny is a specialist restorative teacher and is now teaching the 2-3:15pm restorative class on Sundays. I first discovered yoga during my final year of university. I was completing my Masters in Drama and Theatre Studies and it was a rather stressful time in my life. Yoga was a way of dealing with my stress and anxiety at the time but also learning to befriend my body, something that has been a life long struggle. I remember having a thought at uni that I would really love to learn more about yoga and become a teacher one day but I never voiced this to anyone at the time. Was there a moment when you knew you wanted to pursue yoga seriously? Fast forward about 6 years after graduating and I had left my theatre routes and was starting to work as an exercise instructor teaching classes from Zumba to Legs, Bums & Tums and HIIT (high intensity interval training) classes. I then got my first job working as a gym instructor and personal trainer part-time in a gym. I had built a strong relationship with my manager who gave me a piece of really great advice. I had been going from one training to the next for several months and my manager said that while it was good to be able to teach a variety of different things, she said “don’t just be good at teaching lots of things, be really great at one thing”. What she meant was to find something I was really passionate about and become an expert in that field. Once she said that, the thought of becoming a yoga teacher came back into my mind and I decided that that was what I wanted to focus on. Yoga has allowed me to connect with my body in a way that no other physical practice has. I enjoy exercising and working out but yoga is something completely different to that. Its a way of slowing down, getting intimate with myself and really learning how to listen to my body and what it needs rather than what I think it needs. It’s also allowed me to become more aware of negative thought patterns. I’m my own worst critic and can be very hard on myself, I often feel anxious and get stressed very easily so yoga has really allowed me to become more aware of my thoughts and to notice when I need to take a moment to pause, find my centre and gain perspective on things. Introducing restorative yoga into my practice has been such a game changer for me too. Restorative yoga is my time for self-care. We forget how important that is but I can’t be my best self or give my best if I’m running on empty. Giving myself permission to relax was hard at first but I’ve come to realise how important it is to take time out of my day to replenish my stores. What’s your advice to people considering starting yoga? I know how intimidating it can be to step into your first class. Its so easy to compare yourself to other people and their bodies but if you just make it to the mat and give yourself the chance to experience the practice for yourself, then it really can be a wonderful and even transformative experience. Don’t worry about what everyone else is doing. Your time on your mat is yours, so soften into your own practice, learn to lean in, let go of self-judgment and have fun! Do you have a favourite yoga quote? There are many good ones out there but currently I’m enjoying this one: “yoga is a light, which once lit, will never dim. The better your practice, the brighter the flame” – BKS Iyengar. I really believe yoga is for everybody and I aim to create an inclusive and supportive environment in my classes. Encouraging students to develop their own embodied awareness through a playful exploration of breath and movement, while also teaching healthy alignment. I like my students to have fun, worry less about what your yoga practice looks like, and savour a practice that feels good and nourishing for your body and mind. Is there anything else outside of yoga that would be interesting to share? If I’m not teaching or studying yoga then I’m usually at the gym. I enjoy the benefits of strength training, not for superficial reasons but so that I can feel strong and connected to my body. I recently had a recurring back injury which meant I had to stop exercising and even doing certain yoga poses. As frustrating as it was to feel like I couldn’t move my body in the way I wanted, it taught me to really slow down and work on weaknesses and muscle imbalances. I know how easy it can be to ignore pain and just “push through” but in the long run it’ll only stop you from doing what you enjoy for even longer while your body heals. I also love to travel and experience new cultures. I’m a real foodie too! I recently discovered this show on Netflix called “Chef’s Table”. Its a documentary style show that follows chefs around the world, talking about their life stories, their culture and their love of food. It’s great, just don’t watch it on an empty stomach!